Leslie Cerier’s latest cookbook Gluten-Free Recipes for the Conscious Cook: A Seasonal Vegetarian Cookbook is designed for the gluten-free, vegetarian cook or someone who is gluten free, but wants to add more plant-based, whole grain recipes to their cooking repertoire. Leslie is an organic chef. In fact, she’s known as “The Organic Gourmet.” She embraces what she calls “seed to table” cooking with recipes from her new cookbook like The Ultimate Classic Pasta Sauce and Quinoa and Shitake Pilaf. You can also find her Summer Pasta and Bean Salad recipe on Dr. Mark Hyman’s site. Admittedly, I was not familiar with Leslie Cerier or her cookbooks prior to her contacting me, but when I read that she was teaching classes at Kripalu, I got excited. Kripalu is a world renowned center for yoga and health located in the Berkshires in Western Massachusetts. My gluten-free friends Melissa (Gluten Free for Good) and Jennifer love visiting Kripalu and rave about the retreat center overall, but they especially rave over Kripalu’s food and all the sessions they’ve attended. The fact that Leslie is a chef who teaches at Kripalu does indicate a certain level of excellence! Leslie will be teaching cooking classes at Kripalu in January 2013; you can see her complete class schedule here. 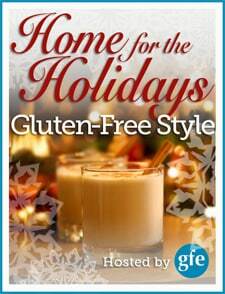 What foods/dishes mean “home and holidays” to you? You’ll also want to check out Leslie’s website; she has lots of info there as well as many more recipes (such as Sweet Potato and Black Bean Chili with Tomatillos and Honey Hazelnut Treats). Melissa’s (Gluten Free For Good) review of Gluten-Free Recipes for the Conscious Cook is also worth a read. 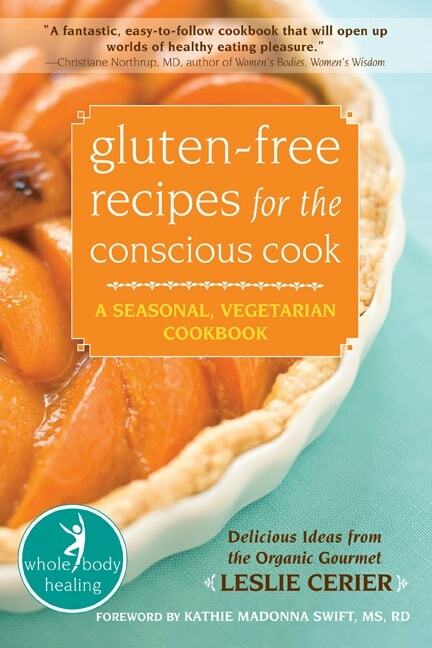 One copy of Gluten-Free Recipes for the Conscious Cook is being given away, courtesy of the Leslie and her publisher. ~ Simply leave a comment telling us about your current favorite gluten-free, vegetarian meal. This giveaway will end Monday, December 17, at midnight EST. I love cookbooks, so of course I want one that suits my eating so well- gluten-free and mostly vegetarian! Not commenting to enter the giveaway as I already own the book, but I wanted to say it is one of my absolute favorite books – I go back to it over and over. Many of the recipes are vegan and many more can easily be adapted to be made vegan too. I’d love to win this book! My favorite GF veggie recipe is Millet-Veggie Balls. I love to make fried quinoa, a healthy and high-protein take on Chinese fried rice! My favorite gluten free meal is Butternut Squash Curry. This book looks great. Thanks for the giveaway. Quinoa stuffed peppers is my favorite. I do have a problem getting enough protein each day so this book would help me come up with more options besides meat. This book looks wonderful! Thanks for the giveaway. Last week I made a casserole of assorted rices, quinoa, green apple, butternut squash and savory seasonings. Covered it with a vegan mushroom gravy that my meat eating husband loved! Hmmm… Maybe hummus with flax bread. Or a vegan version of Pakistani Kima (on my site). It’s a curry dish. I like to have Certified GF Steel Cut Oats with pure maple syrup, and a clementine on the side to start a great day! I was so excited to see the word “vegetarian”! I must check out Leslie’s other cook books! My current favourite vegetarian meal is one that has always been my favourite cold weather meal and that is Nut Roast with Roasted Parsnips and other seasonal vegetables – in our house a classic! Thank you for the opportunity to win this book and have a wonderful weekend! I appreciate the chance to win this cookbook. My favorite vegetarian meal is to make mock Rueben sandwiches using tempeh for the corn beef. Thanks for all the work you put into educating us with all this gluten free healthy eating. I have her book on my iPad. I like her grain to water ratio guide for cooking. Very helpful. Lately I would say my favourite gluten free meal is a large variety of vegetables, some quinoa or brown rice, a broiled chicken breast, and some fruit for dessert. I love a big salad with lots of veggie toppings and home made salad dressing! My favorite vegetarian meal would be macaroni and cheese with tomatoes. Thank you for the giveaway. My favorite? Hmmm… I really liked kabocha sqaush with sesame kelp noodles! Thanks for the giveaway! Oooh, I’ve been a vegetarian for 22 years and GF since I was diagnosed with celiac disease 2 years ago so I will definitely be checking this book out. Thanks for the review! One of our favorite meals around here are fried patties made with various vegetables. Last week was cauliflower and feta, recipe from smittenkitchen. Divine! Looks like such a great cookbook! I’d love to win one. 🙂 Right now our favorite vegetarian/gluten-free meals are black beans & rice with all the fixings, and vegan GF mac and cheese. These are my kids’ favorites, so we make them a lot! I am currently in love with Millet salad with artichoke hearts, sundried tomato, capers, and a dash of GF soya sauce. My favorite is gluten free pizza with pineapple. Gluten free is how I now live and I am feeling so much better. I love sharing new recipes I find with others because I care about their health too. Thank you for all you do! I make a meatless sloppy joe using quinoa. We all love it! Lentil Shepherd’s Pie is my fav.. I like to top it with mixed white and sweet potatoes.. I have the book. It’s wonderful! Peace, love, and conscious cooking! I love lasagna made with thinly sliced zucchini instead of noodles! Quinoa stuffed peppers smothered in cheese and tomato sauce! I can hardly wait to receive this cookbook! Thanks for the opportunity to win!! Hi Jessica–I’m happy to have you here at gfe, but the giveaway has already closed.